There is no secret behind my love with bread. It is also one of the ingredients available at my home anytime. Once upon a time it was like ad-hoc food for us and now I started to prepare many recipes using that. One of them is blogged here. 1) Cut the brown edges of all the breads using a knife. Then cut them into 1 inch pieces. Keep it aside. 2) Chop tomatoes into slices and grind them with red chilli powder to a fine paste. Keep it aside. 4) When the oil is hot, add mustard seeds,urid dal and curry leaves. 5) When they splutter, add onion and saute till they are translucent. 6) Add tomato paste to pan and stir well. 7) If required, add 1/4 cup of water. Add turmeric powder and salt. 8) Stir well and stir fry till the raw smell of tomato goes off. 9) Turn the flame to low and add bread pieces. 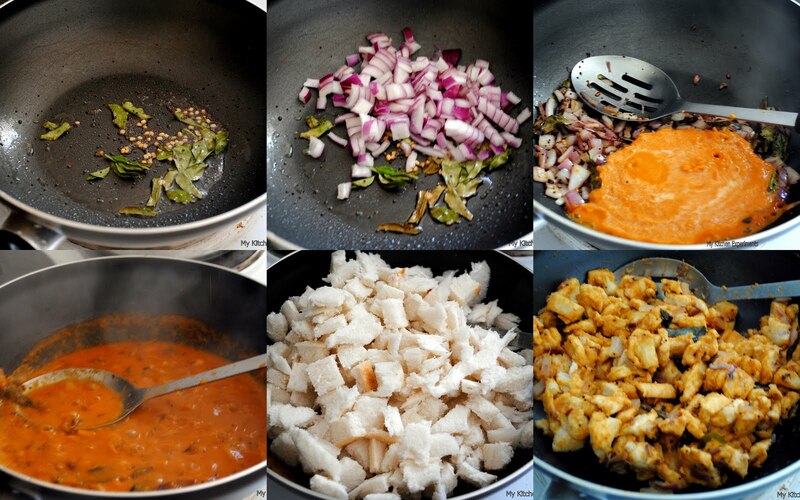 10) Stir gently for 2-3 minutes to mix masala and bread pieces. 11) Garnish with coriander leaves.